Summer might not even be halfway over, but magazine publishers are already focused on fall—or, to be more precise, their big September issues. This year, Hearst is expecting a record-breaking kickoff to the season, having just closed its biggest September ever in terms of print paging and revenue. Continuing the trend of recent years, it was the fashion books that saw the most growth. 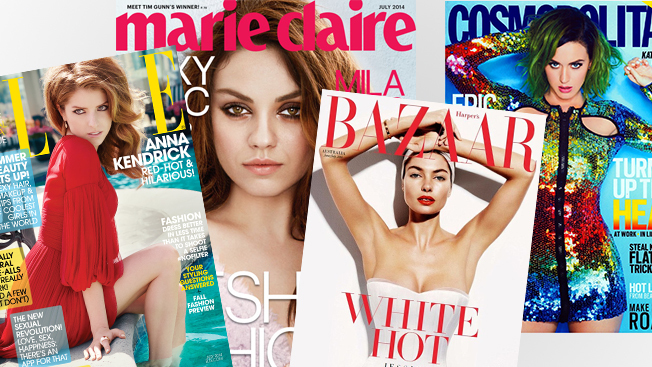 Harper’s Bazaar and Marie Claire, which is turning 20 this year, will publish their biggest-ever issues (Bazaar was up 12 percent year-over-year with 444 pages while Marie Claire saw its pages increase 6 percent to 261), while Elle’s September issue, whose ad pages increased 5 percent for a total of 465 pages, will be its largest issue ever (and the largest issue Hearst has ever published for any title). Cosmopolitan also saw a boost, up 8 percent with 185 pages, as did Town & Country, up 20 percent with 137 pages, while Seventeen and Esquire remained relatively flat from the previous year. Michael Clinton, Hearst Magazines president, marketing and publishing director, said that much of the September growth was due to a rebound in the luxury fashion category, making up for softness early in the year. “The first quarter of the year was so tough for business in general and the retail marketplace was kind of lacking, and what we’re now hearing from a lot of our advertisers is that they’re expecting this fall and the rest of the year to be a much stronger retail season,” he said. European fashion houses, he added, were especially strong this September; with the European economy continuing to struggle, the U.S. market has become more important than ever. A number of luxury brands, including Louis Vuitton, Chanel, Tiffany and David Yurman, will be running large multi-page units across the Hearst fashion brands. Bazaar, for one, will have its entire Carine Roitfeld fashion spread sponsored by Coach, which has been repositioning itself as a higher-end luxury brand. In the beauty category, Olay will sponsor a 20-page booklet in Elle. There are also several non-endemic advertisers shelling out for big units, like Emirates Airlines, which will advertise in Elle, Bazaar, Town & Country and Esquire, and the NFL, which has a multi-page unit in Marie Claire. Elsewhere at the company, Elle Décor, celebrating its 25th anniversary this fall, saw its ad pages increase by a massive 54 percent, much of which actually came from growth in luxury advertising, said Clinton. In the women’s service category, both Redbook and Good Housekeeping managed to lift their pages, by 7 percent and 17 percent, respectively.